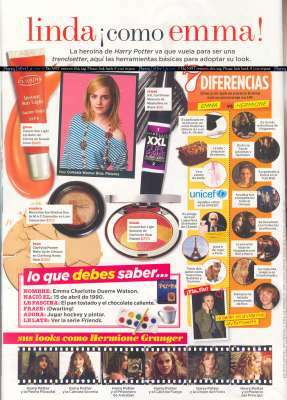 Along with the South African edition, Emma Watson has been featured in the Spanish edition of Seventeen magazine, which published a new cover shot and inside photo. The article itself is a compilation of numerous past interviews Emma has had with various publications, so no new information is revealed. Scans can be seen here. With this Harry Potter phenomenon, do you feel like you've been able to have a normal teenager's life? Yes, I have because I'm still going to school, and that makes a difference. I haven't been home-schooled or anything. If it wasn't because of that I would've gone insane. It must be complicated to be under the public eye like that. People know about everything you do, they take pictures of you with different guys and they say you're dating them. It's like I'm not allowed to have male friends. To the press, I'm dating all of them. But the only way to live through it is to laugh about it.The people must think it's very weird because one week I'm going out with Daniel, then it's a new guy "what is wrong with her?". It's ridiculous. But if the worst thing they can write about me is that I go out a lot with different guys, then I'm not concerned. I had been doubting if I wanted to act for the rest of my life. The reason is because I was only nine when I started. They went to my school, and they picked me. I auditioned and I got the role. I never went to acting school, I didn't know I wanted to be an actress. It's amazing, but just because it happened it doesn't mean that it's the right fit for me. It took me awhile to decide what to do. And now I think it is. I come from a family of lawyers and academics, we didn't watch movies in my house. I didn't know who Gary Oldman or Maggie Smith were. So I educated myself watching thousands of movies. Now I'm passionate about it. I wouldn't go to law school, that's too serious. I would've loved to be a crazy and eccentric painter in Paris. I paint in real life, I love it. What's the weirdest rumor you've heard about yourself? Yea, I would love to be. But it's not true. Everybody keeps congratulating me. I'm not going to take away Keira's contract. Yes, and it's funny when it happens. I felt so weird meeting Matt Damon. I work with amazing people and when I met him I was speechless. I went bright red and embarrassed. It's weird when you go to so many events, all of the sudden they take pictures of you with people you don't know. That time was embarrassing because he knew who I was. I'm amazed! He's supposed to be the new Harry Potter now. I called him and told him "You're taking all the credit!!". I'm kidding. I'm very happy for him, but we haven't spoken. I think it's healthy to have friends outside the industry because I can feel very claustrophobic at times. That's why I want to go to school again so bad, I want to have lots of friends in college. I had a sabbatical year. I've decided that I'll go to America next fall, I'll enroll in an East Coast school, just not in New York, because it would be very distracting for me. You have an amazing career, it's brave of you to take time off. Is your education more important than acting right now for you? I think I would go mad if I didn't go back to school. It keeps me grounded, being with my friends allows me to have a normal life. I don't think you can be a good actress if you go insane. To me it's "Emma, take the trash out". Because I love my family. And I don't have to do my own laundry (laughs). You don't feel like moving out? I might move into an apartment with a friend. We're thinking about it. Yes, I still take the train and people recognize me. It's funny because people whisper to each other "isn't that the girl from Harry Potter?" and then they say "No, she can't be on the train!". I just laugh. All the time. "Are you the girl from Harry Potter?" and I'm like "yeah...". I don't deny it because one time in New York I made a huge mistake. I was skating with my family and a woman came up to me and I told her "Yeah, people say I look like her a lot" and five minutes later she came back and said "How do you dare lie to me?". I felt so bad. Yes, it's intense. I'm not gonna lie. Do you have a personal stylist? No, I don't have anyone. I dress myself. For me. It's something that I really enjoy. It's a genuine thing. I really love fashion, I think it's a way to express yourself and it's really fun. I think it's a subject that it shouldn't be taken to an extreme of saying "Clothes, they're stressful!". If I have to go to a premiere I look for trendsetting designers like Balenciaga and Chanel. I love everything by William Tempest, a British designer. If I'm casual I shop at TopShop, Zara, Gap, Agnes B, Mix and Match. My brother would love it if I got a Lamborghini, but I won't and he's sad about it. I don't feel like investing right now. I just want to do what my friends do and a lot of people who I know don't have that amount of money to spend. I want to do what they do. Go to the movies, eat some place. I live a very normal life. I just got a laptop and it's the most expensive thing I ever bought. Oh, and I got a car, a Toyota Prius. I think women don't know what they want right now. I don't know if I want a guy who pays for everything because it's nice of him to do it, or if I have to pay to show him I'm independent. Luckily my parents are lawyers, which was great. They handled all the legal stuff. WB was a great support because they knew it was going to be a big thing so they worried about all the young actors in the movies, I think I would've felt very lonely if I had been the only kid in that project, but luckily, there were a lot of new kids too, so we could share all that exciting non-experience in the film industry. I chose to do it. It was a four day course. It was good that not all my money got transferred to my account when I hit 18. I wouldn't have known what to do with it. I don't need money anyway, I love with my parents, I have dinner every day with my family. What's been your favorite scene in the entire series and which did you hate? I love the Great Hall scenes. But they were very hard. Some people don't know that we shoot every scene in two or three days, and the food starts smelling funny. There's a lot of lights and it very hot, it starts smelling funny. That's the worst. The best is when we have to do dangerous scenes and stunts. So she's definitely coming to America for college? That's great! You go Emma! thats a really good interview!!!! Oh my...I didn't know the other one was the South African mag! Man, this is when i wish i was still living in SA! HANG ON! Didn't see say in a different inteview that she was living with a friend whose a super model??? The only thing that should be taken as confirmation is what Emma says on her website. great interview,funny and cool! love it and the images! nice interview! totally awesome. plus the humour.